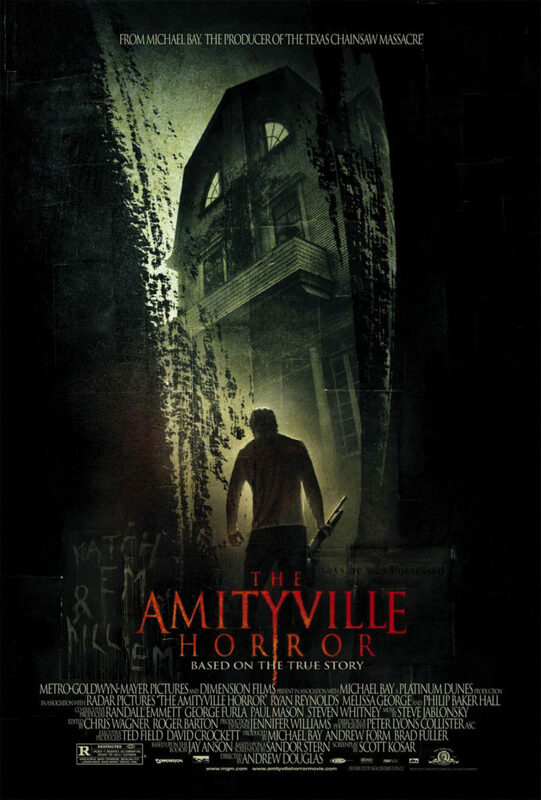 I didn’t find the original Amityville Horror all that memorable of a horror flick, but it had more than its fair share of iconic moments, what with the bleeding walls, fly attacks, and exterior look of the house. It was based on a book that was a supposedly true telling of events the Lutz family experienced after moving into a house on Long Island in the 1970s. The whole story has since been shown to be bunk, part of the Ed and Lorraine Warren hoax industry, but some real awful events did occur in the house prior to the Lutz’s arrival that were used as a precursor to what was supposed to have occurred with the Lutz family. At around three in the morning on November 13, 1974, Ronald DeFeo, Jr. entered the bedrooms of his sleeping relatives — his parents and four siblings — and killed them with a lever-action rifle. DeFeo claimed he did it because he was hearing voices. Six murders carried out in the middle of the night. That’s brutal stuff. To this day DeFeo remains in prison in upstate New York. In 2005, another adaptation of the book was made. Since the original film spawned a number of sequels and became a horror franchise, this new film can be considered a reboot as much as a new adaptation. This telling comes from screenwriter Scott Kosar and director Andrew Douglas. It stars Ryan Reynolds and Melissa George as George and Kathy Lutz. The two need a bigger home for their family and can hardly believe the deal they got on the Dutch colonial house right on the water. Little Chelsea Lutz (Chloë Grace Moretz in an early role) has a new friend only she can see. It’s the ghost of Jodie DeFeo (Summer Courville). There was no Jodie DeFeo among the real murder victims. The closest girl in age was Allison DeFeo. The name change is either the result of lawyers intervening, or the filmmakers showing a little decency in not making a real dead girl a central part of their horror flick. Besides Jodie making appearances here and there, and warning that a great danger lurks in the house, George is beginning to lose his mind. It’s implied that Ronald DeFeo went through the same problems before he murdered his family. Out of the home George seems fine, but back at the house his temper is short, and he emotionally abuses those around him. It’s only a short time before he takes the next step. The story of an evil house changing a man’s personality to the extent he would murder his loved ones should make a pretty good film. But that all depends on the skill and intent of the filmmakers. Good psychological thrillers are hard to make. Peppering a horror flick with enough jump scares to hide the overall lack of tension is weak filmmaking, and that’s exactly what viewers get with The Amityville Horror. The fault doesn’t lie with Reynolds or George or any of the other members of the cast. They were all capable enough. It wasn’t their lack of originality that doomed this flick. Rather, it was Douglas and company. They had readymade source material to draw from. They didn’t have to think of background, context, characterizations, or the resolution of the plot. All they had to do was keep things tense. Rather than put forth the effort, they decided to pack their film with jump scares, the cheapest and least original way to frighten an audience. All jump scares do for me is cause that quick wash of panic, and then I get angry that the filmmakers couldn’t be bothered with genuine scares. That’s too bad. It makes The Amityville Horror yet another film that fails to live up to its potential. But then why would anyone involved in the project care? Their lackadaisical approach to horror resulted in quite tidy profits. Audiences deserve better for their money.